***THERE WE GO WITH SOME SPRING/SUMMER TIME RIDE SPECIALS AT QUEENSBURY AUTO MALL - COME TO 635 GLEN STREET IN QUEENSBURY, NY 12804 TO GET AN ABSOLUTELY GORGEOUS FIAT 500C POP IN A DAZZLING INFERNO RED PAINT JOB AND THE MATCHING CUSTOM RED INTERIOR - TRADE YOUR OLD RIDE INTO THE AUTO MALL AND SAVE MORE $$$ - DON'T MISS THIS PERFECT SUMMER TIME SHINE RIDE ONLY AT QUEENSBURY AUTO MALL CAN YOU FIND THIS RARE DROP TOP*** 1.4L L4 MOTOR WITH 5-SPEED MANUAL TRANSMISSION! POWER CONVERTIBLE DROP TOP ROOF WITH RETRACTABLE SUN SHADE! PREMIUM BOSE AUDIO SYSTEM WITH AM/FM/CD PLAYER, AUXILIARY INPUT JACK, USB IPHONE INTEGRATION AND SATELLITE RADIO! SPORT DRIVE MODE! ELECTRONIC STABILITY CONTROL SYSTEM! FULL POWER EQUIPMENT! FULL CABIN SAFETY AIRBAG CURTAINS AND SIDE AIRBAGS! TOUCH POWER LIFT GATE! FULL CABIN AIR CONDITIONING AND HEATING SYSTEM! REAR WINDOW DEFROSTER! SLIDING/RECLINING SEATS WITH DRIVER HEIGHT ADJUST! TILT/TELESCOPE STEERING WHEEL WITH CRUISE CONTROLS AND ONBOARD COMPUTER CONTROLS! 12 VOLT ACCESSORY OUTLETS! ALLOY WHEELS ON FRESH TIRES! CALL our Sales Team at (518) 792-9800 or email: hotcars@albany.twcbc.com or stop into 635 Upper Glen Street in Queensbury, NY 12804! 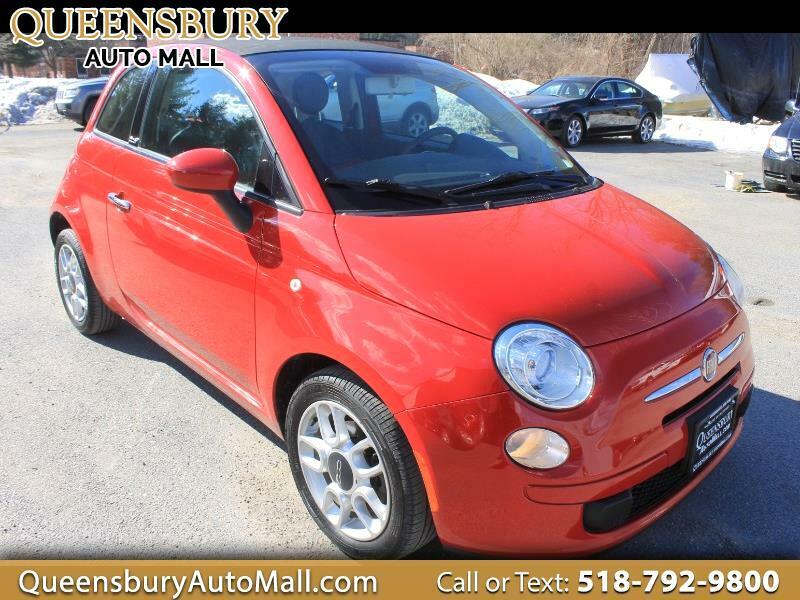 Visit Queensbury Auto Mall online at www.queensburyautomall.com to see more pictures of this vehicle or call us at 518-792-9800 today to schedule your test drive. Message: Thought you might be interested in this 2012 Fiat 500.